If it wasn't for the games he helped create over the years, it's very likely I wouldn't be writing this. Beginning with "Ultima Underworld" and culminating in "Thief: The Dark Project", the titles that Doug Church had a major hand in convinced me that games were on the cusp of becoming a new art form-- and something I should devote my creative energies to. (Leading me, willy nilly, to this online world that's sort of a game, but also not.) 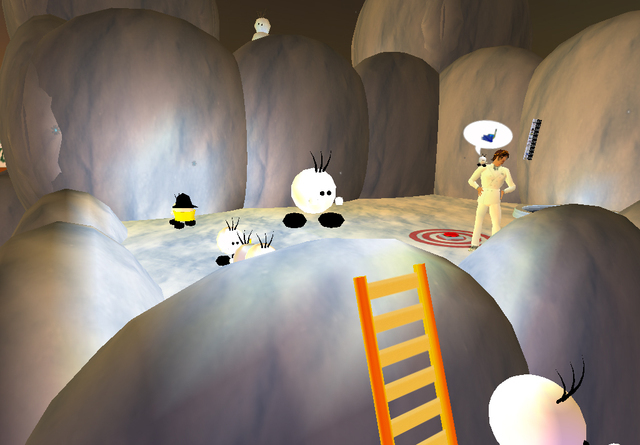 So it was tremendously gratifying that I got to help bring Doug in to judge the Second Life Game Developers Contest a few months ago, and hopefully, for the folks he judged (including the grand prize winner "Primmies", sort of a crazy multiplayer 3D Lemmings, depicted here). Doug's comments were awesome. I'm actually using his RCR suggestions in a new game my consulting team has been hired to design/script and build. Hey, they look like that with local lighting on? That's pretty freakin' cool! I can answer that, Torley. When I built the little guys, I set an invisible prim on them as "light" so you could see them from far distances (as it affects the max range the client picks them up). It seems to have the unintended effect of lighting up the ground around them. I was... "afraid of that," but it actually makes it look BETTER!